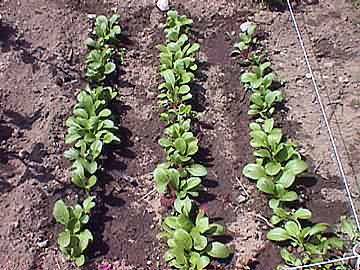 If you have never planted bok choi try it! It grows really fast and is very beautiful. The first picture was taken in May of 2000, such cute little plants all lined up in a row and perfectly thinned! The Second picture was taken in August of 2000. The plants are going to seed in this picture. 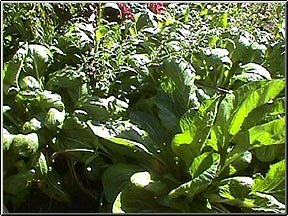 But unlike lettuce bok choi is still yummy even after it has gone to seed. The flower blossoms are good to eat too! The third picture was taken in July of 2000 it is a mature plant. 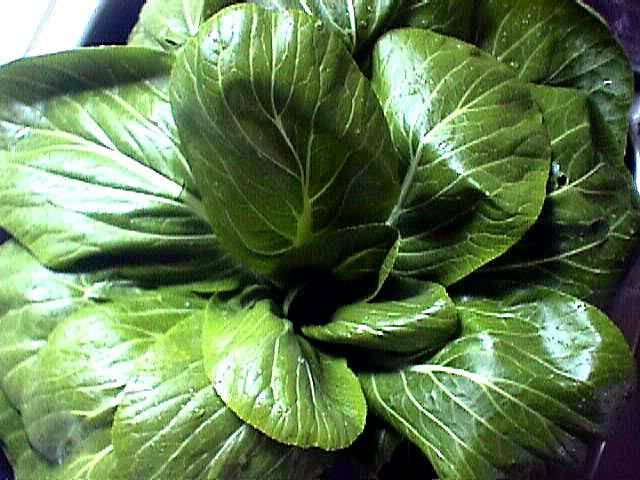 Bok choi is so pretty and easy that I think everyone should try growing it. I stir fry it and eat it with teriyaki sauce. I also add it to my salads and eat it raw.